Former federal prosecutor and FBI agent Chris Hunter of Trinity bested Democratic challengers Stephen Perenich, a Tarpon Springs tax consultant, and Robert Tager, a criminal defense lawyer from Lutz. [DOUG CLIFFORD/STAFF] Chris Hunter, 45, center, took an early lead in the Democratic primary for Congressional District 12. 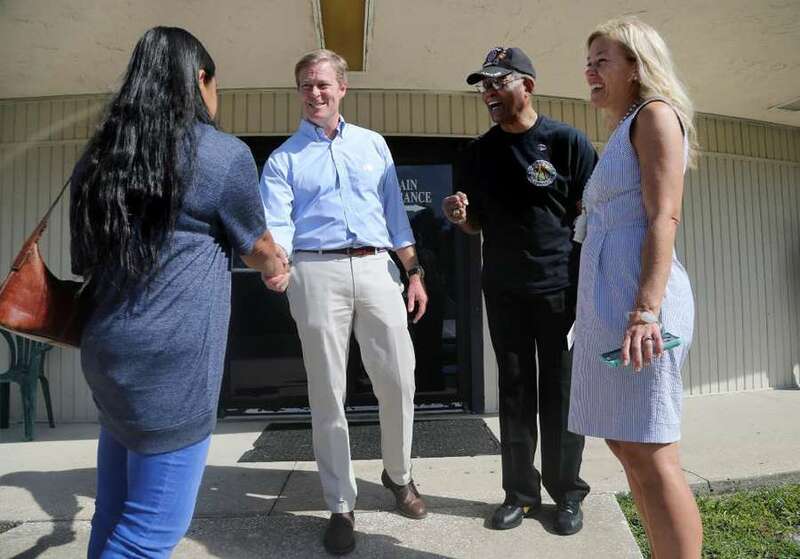 Here he meets Kim Blango, left, and her husband Robert Blango on Tuesday while visiting the polling place at Asbury United Methodist Church in New Port Richey. At right is Hunter's wife, Celeste Hunter. Former federal prosecutor and FBI agent Chris Hunter swept the Democratic primary for Florida's 12th Congressional District on Tuesday, securing his bid to challenge longtime U.S. Rep. Gus Bilirakis, R-Palm Harbor, in November. Hunter, 45, of Trinity won about 65 percent of votes over his two primary opponents, according to unofficial results. The district covers northern Pinellas, all of Pasco and a sliver of northwest Hillsborough counties. "Voters throughout my district are ready for honest leadership and a renewal of an American service ethic that really has the power to be transformative," Hunter said of his victory. "That transformative power is something that can get us through a very difficult time. It has a power that has potential to be unifying." Hunter bested Tarpon Springs tax consultant Stephen Perenich and Lutz criminal defense lawyer Robert Tager, who first ran against Bilirakis in 2016. The race is already being watched on the national stage as Democrats work to flip 24 Republican seats to regain a majority in the House. Florida's 12th District has historically been a solid red stronghold, which President Donald Trump won by 19 points in 2016. Bilirakis, 55, is running for a seventh term in the seat his father, Michael Bilirakis, held for 24 years before him. But the Democratic Congressional Campaign Committee has pegged Bilirakis' seat as winnable based in part on Hunter's candidacy. Hunter, the only former federal prosecutor and FBI agent running for Congress, quit his job with the Department of Justice in Tampa in December to try to unseat Bilirakis. "There's a widespread belief that Gus Bilirakis has a Congressional seat that he didn't earn and that he has spent 12 years squandering the privilege of serving all of us," Hunter said. "When I talk to voters, I talk to Republicans, Democrats and (no party affiliated), and all of them have that same view." And Hunter has built national momentum in his campaign so far. He had raised $465,627 to Bilirakis' $1.44 million, according to Federal Election Commission filings. Of the $388,800 Hunter has raised from individuals, about 62 percent are from donors outside of Florida, according to a data analysis by news website Axios. Hunter has been searingly critical of Bilirakis' record in office, including the Republican's financial support from the pharmaceutical and health products industry in 2016. That year, Bilirakis also co-sponsored legislation making it harder for the Drug Enforcement Administration to go after drug companies that distribute suspicious quantities of prescription pills to doctors and pharmacies. Hunter has also blasted Bilirakis' support from special interest groups and political action committees, which makes up nearly half of his campaign contributions. Hunter has so far raised $17,000 from political committees but groups tied to Democratic House leadership as opposed to special interests, according to federal filings. In a statement to the Tampa Bay Times Tuesday evening, Bilirakis congratulated Hunter on his primary victory.
" I look forward to debating him on the issues that matter to our community and expect a spirited campaign that will highlight my record of service for the constituents of Florida's 12th Congressional district," Bilirakis said.